First of all we, the Nuxalk Nation, would like to acknowledge Tatau, The Creator, through Manakays, the Great Spirit, for all that he has provided since the beginning of time and still provides today. We, the Nuxalk Nation, stand in the position of sovereignty against International Forest Products (INTERFOR). We cannot and will never as the Nuxalk Nation compromise this position. The Sovereignty of the Nuxalk Nation comes from Tatau, the Creator. It is not granted nor subject to the approval of any other nation. As the Nuxalk Nation we have the sovereign right to jurisdictional rule within our own territory. Our lands are a sacred gift. The land is provided for the continued use, benefit and enjoyment of our people, the Nuxalkmc, and it is our ultimate obligation to Tatau, the Creator, to care for and protect it. INTERFOR has continually raped our lands and continues to do so today! Our old villages, hunting grounds, fishing grounds, grave sites and sacred areas are being destroyed. Our fish and animals that we need to feed our peoples are disappearing. Our food plants, medicinal plants and trees are being trampled on and destroyed, all for the corporate value of the lumber. We, the Nuxalk Nation, take this stand today and forever to state: “That we are appalled at what INTERFOR has done and is still doing today, to our Nuxalkmc Territory. We have never nor will we ever give our consent to INTERFOR or any other corporation to develop within our territory. 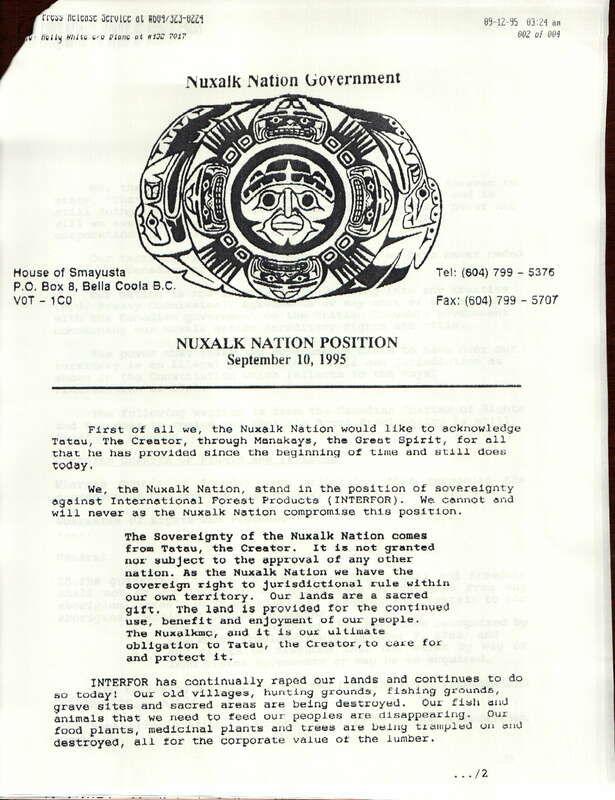 “Our territory is ours, the Nuxalkmc, and we have never ceded it to the Canadian or B.C. provincial government. The power that these two governments claim to have over our territory is an illegal power within their own jurisdiction as shown in the Constitution which reflects to the Royal Proclamation of 1763. 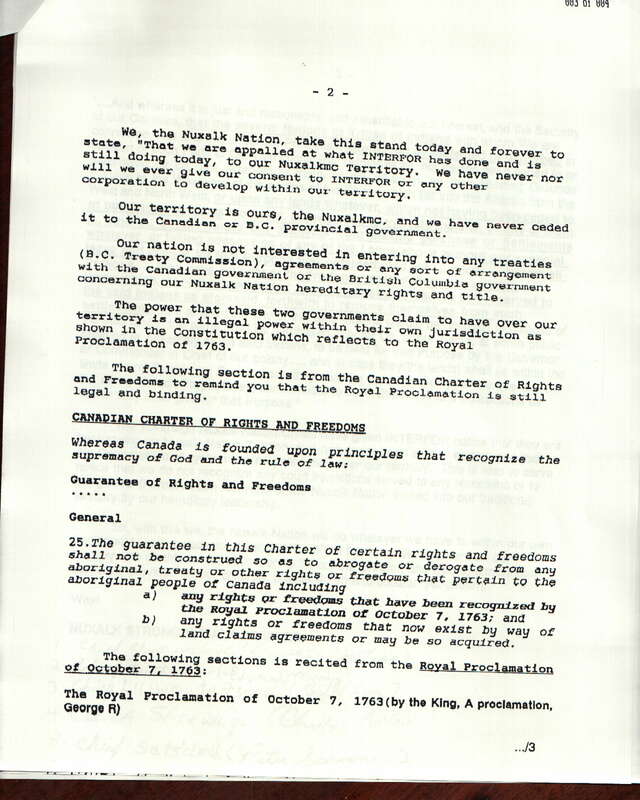 The following section is from the Canadian Charter of Rights and Freedoms to remind you that the Royal Proclamation is still legal and binding. Guarantee of Rights and Freedoms…. b) any rights or freedoms that now exist by way of land claim agreements or may be so acquired. …lying to the Westward of the Sources of the Rivers which fall into the Sea from the West and North West, as aforesaid; and We do hereby strictly forbid, …Our loving Subjects from making any Purchases or Settlements whatever, or taking Possession of any of the Lands above reserved, without Our especial Leave and Licence for that Purpose first obtained. And We …strictly …require all Persons… who have either wilfully or inadvertently seated themselves upon … Lands, which, not having been ceded to, or purchased by Us, are still reserved to the said Indians as aforesaid, forthwith to remove themselves from such Settlements. 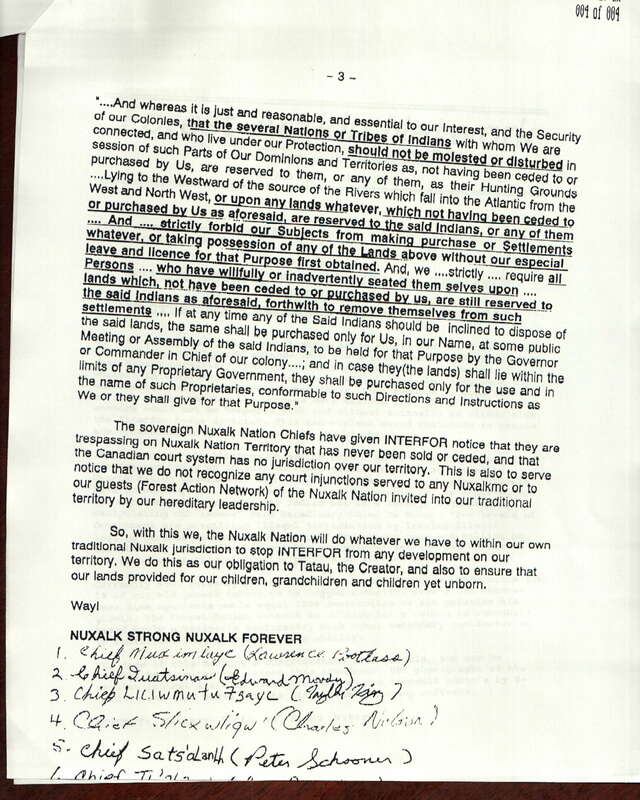 The sovereign Nuxalk Nation Chiefs have given INTERFOR notice that they are trespassing on Nuxalk Nation Territory that has never been sold or ceded, and that the Canadian court system has no jurisdiction over our territory. This is also to serve notice that we do not recognize any court injunctions served to any Nuxalkmc or to our guests (Forest Action Network) of the Nuxalk Nation invited into our traditional territory by our hereditary leadership. So, with this, we, the Nuxalk Nation will do whatever we have to within our own traditional Nuxalk jurisdiction to stop INTERFOR from any development on our territory. We do this as our obligation to Tatau, the Creator, and also to ensure that our lands provided for our children, grandchildren and children yet unborn.